About two years ago, I received one of those university-wide mass emails aimed to solicit scientist volunteers to help teach science at an underprivileged school in Manhattan. Given my interest in science education and communication, I read on. The request was on behalf of something called the Cell Motion BioBus, which is a 1974 San Francisco transit bus that has been converted into a high-tech mobile microscopy lab, and for that particular day, the duties of the scientist volunteer involved teaching 3rd graders about the tiny crustacean, Daphnia. A few weeks later, I found myself inside The BioBus, hanging out and talking science with a bunch of very excited 8-year-olds. We spoke about the habitat where Daphnia lives, the food it eats, and how it reproduces. We examined Daphnia anatomy using diagrams on the computer, being sure to locate the heart. After this lesson, the kids went on to mount real Daphnia samples onto microscope slides so that they can look at these tiny "water fleas" at high magnification. The kids did not hold back with their enthusiasm, laughing and giggling while pointing out Daphnia legs, antennae, and the beating heart. It was such a wonderful experience that I wrote about it. Watching their faces light up with wonder and amazement over something so simple was incredibly gratifying for me, and I immediately came to understand why Dr. Ben, a Columbia University-bred PhD physicist, turned down several coveted offers to become an academic lab head. He, along with Sarah Weisberg, is currently fulfilling the dream of bringing science education to often-overlooked communities. However, as with many a good initiative, funding is limited. 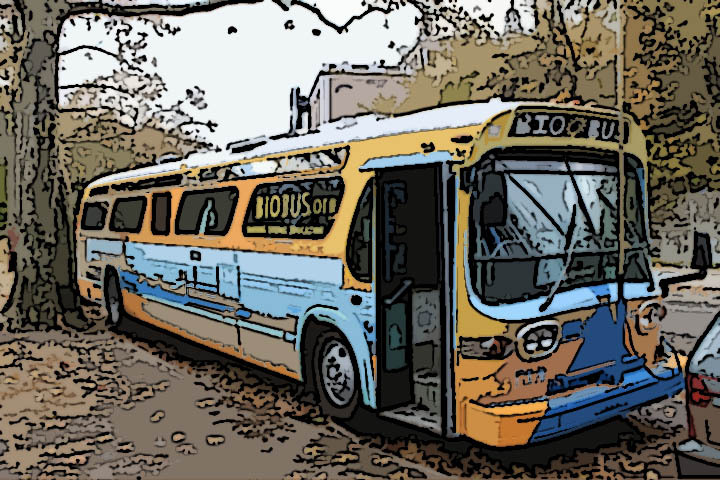 I am writing to tell you about a great non-profit organization I've been volunteering with, called the Cell Motion BioBus. The BioBus brings practicing scientists (graduate level and above) to teach K-12 students aboard their mobile lab -- a converted 1974 transit bus that now houses a research-level microscope lab. I myself have seen how students of all ages and backgrounds respond to the BioBus, and it's usually along the lines of, "That was AWESOME!" The BioBus is also an amazing story of grassroots fundraising and charitable giving: the lab was built using donated equipment and labor and right now, the BioBus is at the end of a cross-country tour, during which it was able to bring research-level science to schools in places like rural Kansas, funded by small donations from its supporters. 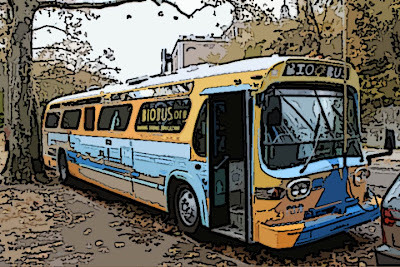 Now, the BioBus needs help finishing its fundraising campaign so it can return to NYC and continue teaching in 2012. Please help by visiting www.fundly.com/biobus and giving what you can -- this is grassroots work, and any amount helps! Below is are a few videos of The BioBus trip thus far, which you can find on The BioBus YouTube Channel. If you are willing and able, please donate to this cause. Putting a science-induced smile on a kids face will be well worth it!